The consumer unit(commonly known as the fuse box) has a main isolating switch which turns all the power off. 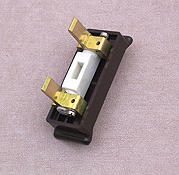 Additionally you will see a number of fuse carriers, or in newer units circuit breakers. In older houses which probably haven't been rewired for a long time you may have a consumer unit with pull out fuse carriers which either have a wire fuse which you change with fuse wire, or a cartridge fuse which slots in place. If a fuse blows you will need to replace these. Make sure you switch off the main isolating switch on the consumer unit. NB IT IS ESSENTIAL FOR THE SAFE WORKING OF YOUR HOUSEHOLD WIRING THAT YOU USE THE CORRECT SIZE FUSE OR FUSE WIRE. Cartridge fuse holder. Some simply pull apart, some have a retaining screw. 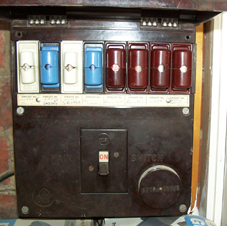 An old consumer unit with pullout fuse carriers. Here the fuses are cartridge fuses. Other types use fuse wire. Tip have some spares fuses or fuse wire handy with a torch near to your consumer unit so you can change them if they blow which may well happen when its dark. Modern consumer units don't have fuses they have circuit breakers. 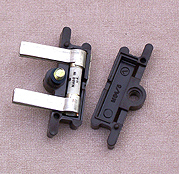 These are a much more convenient system because they are resetable by simply flicking the reset switch back into the on position. 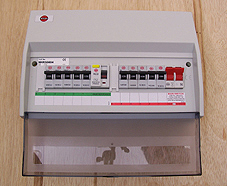 Modern consumer unit with circuit breakers. This one is a split load. Half the circuits are additionally protected by and RCD Individual circuit breaker. These are fixed inside your consumer unit. Do not attempt to remove.